We are heading towards a world that struggles in addressing rising global energy demand and climate change – at the same time. Markets demand sustainable solutions and new opportunities open for those who are willing to embrace the change. The energy sector will witness significant changes. Global commitment to tackle climate change requires major efforts to reduce emissions and the use of fossil raw materials will inevitably need to decline in different markets. Therefore there is significant potential for renewable solutions in the road transport sector as well as in aviation and the plastics industries. Our strategy and Way Forward to 2030 -program are guided by our purpose and vision: Creating a healthier planet for our children by creating responsible choices every day. Passion for renewal and our Forward Way of Working are at the heart of everything we do, guiding our way to Neste in 2030. Sustainability is also integrated into our values that guide everything we do. Our sustainably-produced solutions for decarbonizing road transport, aviation, and chemical sectors are our most significant contribution to the implementation of the Paris Agreement, as well as, the United Nations’ Sustainable Development Goals (SDG) on “Climate Action” (SDG 13) and “Sustainable Cities and Communities” (SDG 11). With these solutions, we create added value to the society while enabling our customers to minimize their environmental footprint, which ultimately benefits people, as well. Neste's renewable diesel celebrated 10 years of reducing emissions. During those ten years, the innovation has made Neste the world's leading circular economy company in biofuels and reduced greenhouse gas emissions from traffic by more than 33 million tons. In addition to road transportation sector, we develop new renewable solutions and services for the aviation industry. We continue to develop bio-based plastics and our renewable solvents and bio-based chemicals businesses together with our customers and partners along different value chains. We aim to increase the proportion of our renewable solutions outside of road traffic to 20% of the total sales volume by 2020. We have invested approximately EUR 1.5 billion in the renewable fuels production capacity in order to be able to produce altogether some 2.7 million tons of renewables annually. They offer an efficient way of combating climate change. Our target is to increase production capacity to 3 million tons by 2020 and reach 4 million tons capacity by 2022. By increasing our production capacity, we simultaneously increase our capacity to reduce climate emissions. The Board of Directors approves policies covering sustainability, and monitors how Neste performs in terms of sustainability. Neste Executive Board is responsible for outlining the company’s strategic approach to sustainability and monitoring how sustainability is reflected in the business unit and support function operations. Sustainability work is the enabler of our business strategy, and sustainability goals are an integral part of the business area objectives. For example, the development of Neste's safety management and practices, as well as increasing the use of waste and residues in the production of renewable products are topical strategic focus areas that require sharing of competence and cooperation across organizational boundaries. 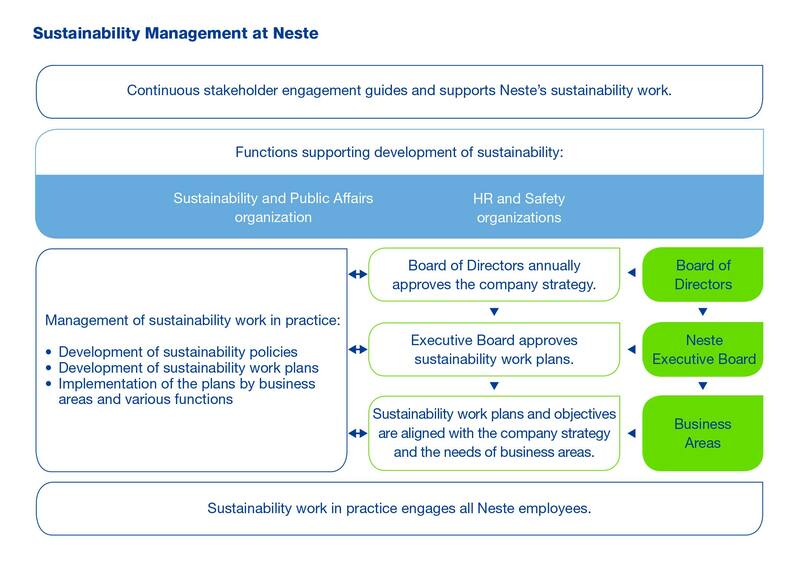 Neste’s business areas are supported by Neste’s Sustainability organization, as well as Human Resources and Health, Safety and Environment (HSE) organizations. The SVP, Sustainability and Public Affairs, and SVP, HR & Safety, who are both members of the Executive Board, carry the main responsibility for the day-to-day management of the company's sustainability work. Matters related to sustainability are reviewed regularly at the meetings of the Board of Directors and Neste Executive Board, as well as the management teams of the business areas and refineries, the organizations responsible for practical sustainability work. We want to create a healthier planet for our children by creating responsible choices every day.